If you can marinate the beef, so much the better, but it's still delicious even if it's thrown together at the last minute. Serves two. Combine the beef with the marinade ingredients, cover and refrigerate. Leave it for up to five hours, if you're able to prepare the meat ahead of time, but even 20 minutes will do. Heat a wok, without any oil, over a medium heat. Add the cashews and toast them, tossing frequently, for a couple of minutes, until lightly browned. Set aside. Put the kale in a colander and pour a kettleful of boiling water over the kale to wilt it. Leave to drain. While the noodles are cooking, heat the oil in the wok over a high heat. Drain the beef from its marinade, reserving the marinade. Give the beef a pat with kitchen paper so it's fairly dry. Add it to the hot wok and stir-fry for about two minutes, until browned all over. Add the kale and the marinade juices, and stir-fry for another two minutes or so. Toss in the cashews at the last minute. Give it a squeeze of lime juice, then taste and add more if it needs it – and a little salt if you like. 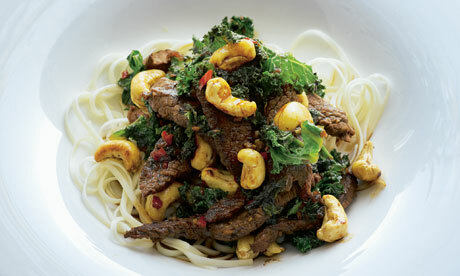 Drain the noodles and arrange on two plates, top with the beef and kale, and serve straight away.